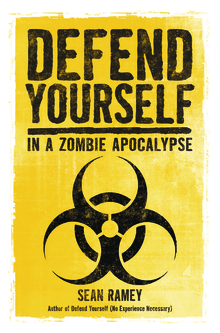 Sean Ramey's "Defend Yourself (In A Zombie Apocalypse)" is a follow-up to his much-lauded "Defend Yourself (No Experience Necessary)." Ramey's intention for his newest book is to equip the living with the necessary unarmed combat skills to fight the dead. A U.S.A. Martial Arts Hall of Famer, Ramey's goal is to arm individuals with the necessary skills to survive if faced in a life-threatening situation with the living or dead, using only hand-to-hand combat. The book is limited to a few simple-but-effective techniques that can be implemented when needed. An individual have only one chance to save his or her life. This opportunity should not be squandered. The more Ramey's "Defend Yourself" techniques are practiced and used, the more effective they will become. Remember: life is no movie — you have only one take to get it right. Learn the techniques. Understand the techniques. Implement when necessary.